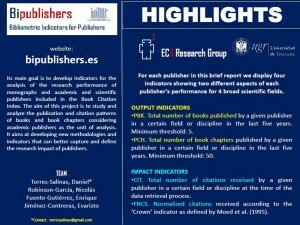 Bibliometric Indicators for Publishers project. Its main goal is to develop indicators for the analysis of the research performance of monographs and academic and scientific publishers included in the Book Citation Index. This is project is carried out by the EC3 Research Group from the University of Granada. It offers tables of indicators by publisher for 4 broad fields and 38 disciplines. This allows the reader to have a general overview of the bibliometric performance of a given publisher but also visualize which are the disciplines in which it is mainly focused. The information displayed is based on the Thomson Reuters’ Book Citation Index. This should be taken into consideration when analyzing the results as this database has serious limitations that may bias the results. It shows six bibliometric indicators for each publisher by field and discipline for the 2009-2013 time period. Three types of indicators are available: output, impact and publisher’s profile. More information regarding the selection of indicators is available in Data and Indicators. Torres-Salinas, D., Robinson-García, N., Fuente-Gutierrez, E. & Jiménez-Contreras, E. (2014). Bibliometric Indicators for Publishers [indicate version]. Available at: http://bipublishers.es [Accessed day, month, year].